Relationship building is our top priority. For more than 35 years we have been performing medical examinations to our nation’s heroes and workforce. Our goal is to build strong partnerships with our network of providers that support and enhance QTC’s commitment to quality, timeliness, and customer service. Let’s build a strong relationship. If you have the time, we have the work. To get the application process started on becoming an esteemed member of our provider network, complete the online contact form, and a QTC Representative will contact you. Be sure to inquire about our Provider Referral Program and its rewards. Our demand is high for qualified independent and staff examiners, which is why we want to hear from you. Select your state for a list of available provider opportunities near you. How flexible is your scheduling? If you are looking for predictable hours with flexibility to match your schedule, QTC is an excellent option. How many appointments are scheduled in a day? Week? Month? It’s difficult to provide an exact number, but QTC does work with various clients. However by becoming a part of our preferred provider network, you will be given as much business as we have and as much as you're willing to accept. All of QTC's clinics are open Monday through Friday. Some are open on Saturdays and occasionally Sundays. What types of individuals will I be evaluating? You will have the opportunity to evaluate a variety of individuals including our nation's veterans, soldiers returning from Iraq and Afghanistan, Federal Air Marshals, Secret Service personnel and many others. Do I rate the disability for each person I evaluate? No, never. Your report documents and provides the medical information needed for the appropriate agency to make the rating decisions. You do not determine compensation for the patient's case. Can I treat or prescribe medication to a QTC examinee? The nature of the examinations you perform through QTC does not permit treatment nor prescribing of medication. However, in the event of a life-threatening emergency, you are entrusted to seek help and perform any necessary procedures to sustain the patient's life. Do I have to write or dictate a report? Yes, QTC's exams require a narrative report. Depending on the requesting agency, you have three ways to submit the report: 1) utilize QTC's secure website to deliver the report, 2) utilize QTC's transcription services, 3) utilize your own transcription services. What are the report requirements? Each client has different report requirements. QTC provides extensive orientation and training prior to your first exam to ensure that you meet or exceed client expectations and service requirements. Why does the client ask me to make clarifications on the report I submit? The client needs to be absolutely certain of your opinion since the medical information you provide has a direct effect on a patient's benefits decision. Payment is dependent upon the terms of your agreement with QTC. QTC works with various clients including the Department of Veterans Affairs, Department of Defense, Health and Human Services, Railroad Retirement Board, and Social Security Administration. What specialties do you contract? We contract with a wide range of specialties including internal medicine, orthopedic surgery, occupational medicine, psychiatry, otolaryngology, ophthalmology, audiology, dentists, family practice, optometry, cardiology and more. What are QTC’s credential requirements? A current, active, unrestricted license in the state of practice with no disciplinary action. You are required to maintain good standing throughout the duration of the contract and to ensure compliance; we perform periodic credential checks. Please do not enter any sensitive information. By using this form you agree with the handling of your data by this website. Your form data will not be stored in this website. Interested in a new opportunity that travels around a beautiful state? 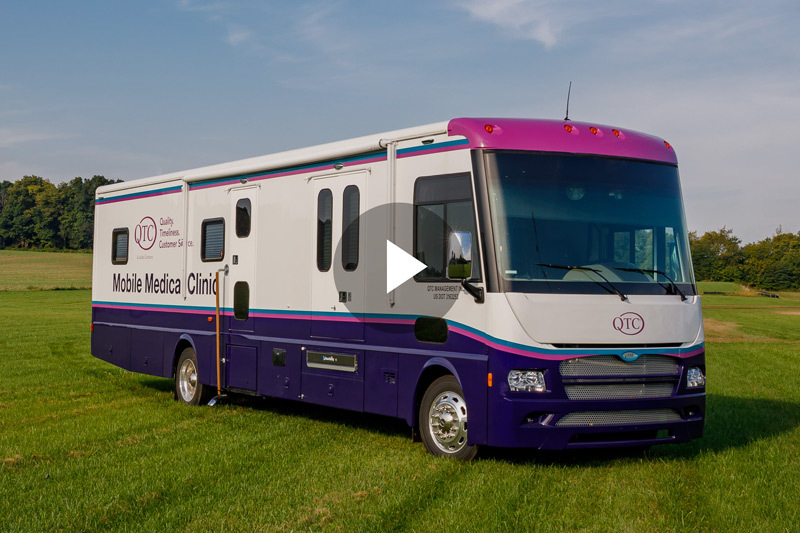 Experience a new scenery while providing medical examinations aboard our mobile medical clinics, while earning all the benefits QTC has to offer. Click here to learn how you can apply to be a provider for our new, state-of-the-art mobile medical clinics.